(reprinted with permission of the author and the magazine). "1976 Starsky & Hutch Gran Torino Update"
I have just finished reading (with great pleasure, I might add) the article about the Starsky and Hutch Gran Torinos and would like to thank you for taking the time to make the story so accurate. You may be interested to know that I was involved with this project as an employee of Ford Motor Company at the Chicago Assembly Plant. I started there in March 1969 in the Paint Department and worked for Ford until August 1981. During the period from 1974 until my departure from Ford, I was a Paint Mixer. My duties included mixing paints for application on cars scheduled for the repair floor. The repair floor included "main paint repair," which is where tu-tone cars received their second color of paint, and where "special order" paints were applied. Take a look at Bill Shenk's Generic Assembly Plant Floor Plan in the same issue (January-February 1996 issue of Fairlaner magazine, page 11) and note the location of "Paint Repair." This generic plant is somewhat different from Chicago Assembly, but is accurate enough for demonstration. The "specials" included fleet paint colors, such as American Cab, Continental Telephone, etc., as well as limited production units, such as the "Starsky & Hutch" cars. When I began working at Chicago Assembly in 1969 we were making the "Big Fords" (LTD, Galaxie, etc. ), but in 1974 we began running the Gran Torino Elite, which by the '75 model year became just the Elite. Actually we made the model change from the big cars to the Elite during the December '73 Holiday shut down. The car was so successful, Ford made only this car at Chicago in 1974 and 1975, but by mid-year of the 1976 model (December 1975), it had become apparent that this car would no longer support the entire plant operations. With the Torinos having become so popular by this time, Ford avoided laying off personnel by adding the basic Torino body style to the production line along with the Elite. Adding the Torino to the Elite assembly line wasn't very difficult as both units were based on the same frame (remember frames?) and floor pan. In March of 1976 we began running the "Starsky & Hutch" version of the model. The pre-production and "Chicago Auto Show" units were made in either late January or early February, so as to be done in time for the big auto show event. It also gave us line personnel the training on how the painting, masking and various trim differences were to be accomplished. All cars, except special color application units, were first painted in the Main Paint Spray Booth with three coats of paint, plus two coats of paint on the door jambs and inside the trunk area. The unit then went through the main enamel oven that varied in stages from 325 degrees Fahrenheit to 390 degrees Fahrenheit, in order to bake on the paint. After each car emerged from the oven it was immediately inspected for paint defects, then was sent across to the Trim Department via overhead conveyor. If the paint was to receive a second color (tu-tone), special order paint, or required paint repair, it was then sent to the paint repair/tu-tone spray booth via this section's repair line. All the "Starsky & Hutch" cars were sent down this line. The "Starsky & Hutch" cars received two coats of white paint (standard Ford production white) in the Main Paint Spray Booth on those areas of the body that were to be white on the finished unit (the middle of the doors, quarter roof and part of the top). Then, at the tu-tone masking area the masker(s) would apply a special decal developed for Ford by the 3M corporation which covered the areas that were to remain white. Next, the unit was sanded for adhesion, sent into the tu-tone booth, and sprayed with an additional three coats of the 2B red. These units were then sent into the tu-tone oven for curing. As the unit emerged from the oven it was inspected for defects and either stripped of its masking decal or sent back to tu-tone for additional repair. Once painting was complete the cars were sent to trim. The front fenders and hood were painted on the east side of the plant in the area called "Small Parts Paint," which was immediately adjacent to the final assembly or Chassis Line. Please remember, I am speaking ONLY of the Chicago Assembly Plant from 1969 through 1981, and in no way contradict Bill Shenk's article of the basic assembly plant for the Fairlane/Torino cars during the period 1960 through 1970. 1. Yes, we only made 1,000 of these units. I think 1,002 or 1,003 with the show and training units. For reasons known only to Ford, training and show units were never sold, but were crushed when the company was finished with them. 2. Yes, the PS-122 was on all of these units along with the 0022 DSO number. 3. All "Starsky & Hutch" units were painted white, then red. This was to prevent "bleed through" of the red. In other words, if the red had been put on first it would have been nearly impossible to keep the red from showing through from behind. 4. No, there wasn't any black (or any other color) stripe around the border of the white. 5. 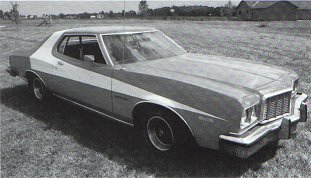 The paint code 2B was indeed a special color for 1976 (I mixed most of it myself), but was a standard color on the 1972 Torino. My brother is currently restoring his 1972 "429" Torino, and it was painted this color as a regular production choice. 6. Every "Starsky & Hutch" I saw leave the plant did have the Magnum wheels or some other type of "MAG" wheel. (I certainly would have remembered seeing one with wheel covers for example, as it would have looked odd). Every "Starsky & Hutch" Gran Torino I observed leaving the plant did (as best I can recall) have the Torino insignia over the gas door. One way to check for correctness is check the backside of the gas door for the nuts Ford surely installed on the emblem and check for additional holes drilled in this area. If this emblem was installed as an aftermarket item, there will be either no holes drilled in the back of the door (glued on) or there will be additional holes, meaning someone obtained this emblem after the car was on the street and drilled their own holes in order for the emblem to fit. Ford was real big on different trim packages having different installation hole patterns and having each unit's sheet metal pre-drilled accordingly during body construction. This aided in saving time as the person on the line charged with this operation could look at the hole pattern and immediately determine which trim piece to put on the car. Evidently, Doug's car is one of the first and Kat's is one of the last as we finished production of these cars in late May or early June - because Ford wanted to insure these units were "out the door" long before model change in late July. I hope this will help in your club's research of these cars. I am currently seeking a "real" "Starsky & Hutch" unit to restore. If you know of any on the market, please let me know. Created September 11, 1999. All Rights Reserved.